A dejected Mosely longs for a childless household in a scene from Jackie Juliana’s children’s book, Baby Bummer. Would-be children's author Jackie Juliana already has tackled the hard parts: packed lunches, field trips, countless kissed boo-boos and laundry - lots of laundry. Now she just needs to get her book published.And she's close. 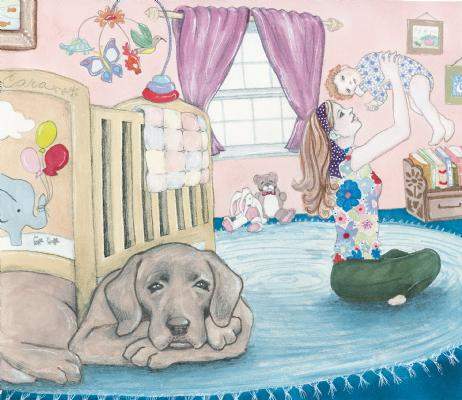 Juliana's story, Baby Bummer, is a finalist in the ABCs Children's Picture Book Competition. The competition, now in its fifth year, is the brainchild of Rita Mills, who conducts the contest for the Houston-based publisher Bluebonnets, Boots & Books. Mills was spurred to start the contest based on an industry statistic that claims only three of every 12,000 children's books submitted for publication are ever put into print. "I don't have the kind of network that a lot of writers do, so I need all the help I can get," said Juliana, a New York City native who now lives in Durango and raises two young daughters full-time. The story is simple and one that Juliana lived firsthand. A young girl resents the household's new baby, but eventually comes around with the help of the family dog. The story is beautifully illustrated by freelance artist Eloise Corr Danch, whose pictures appear on every page. Juliana said she'd never met Danch, who lives in New York, but Mills connected the two sight unseen, and it worked out splendidly. A Durango connection was the oddest of coincidences. "When I first contacted her, I mentioned that I live in Durango," Juliana said. "She wrote back right away and mentioned that her brother lives here and was getting married in a few weeks, and that she was coming out for the wedding. It was just a very quick trip, but I got to meet her! Wild, huh?" Baby Bummer is one of 12 finalists chosen from more than 175 entries in the ABCs competition. Beginning Sept. 20, readers can vote online for two weeks, and the submission with the most votes gets a golden pass into the publishing world: Juliana would receive a royalty-based contract, 1,000 copies of the finished book and discounts on future printings. The ABC's has distribution in place to make the books available to all bookstores, as well as libraries, throughout the United States.